I get together with my college girlfriends once a year for a weekend of belly laughing, binge eating and drinking. I know they’re reading this, so let’s be honest ladies – our days of being able to drink all night, dance like Beyoncé’s back-up dancers and eat as much as we’d like are long over. They were viciously taken away from us with the birth of our children, turning 40 and as my 13-year-old reminds me, our lack of present day coolness. What we lack in coolness is compensated for by our collective chefness. I don’t think that’s a word, but I’m going with “chefness.” We are all brilliant cooks, and when you put us together we make a killer spread that would make Gordon Ramsay proud. And if he’s not proud, one of our other talents is being able to curse like truck drivers, so we can give it right back to him! I guess I had too many glasses of wine when I gave this recipe to my friend during our last weekend together. She called me with questions over the holidays and I had no idea what she was talking about, and had no written recipe here to help her. I think I just threw a little of this, and a little of that together to make this spicy peperonata. Thanks to Kristin, for helping me pull this together. 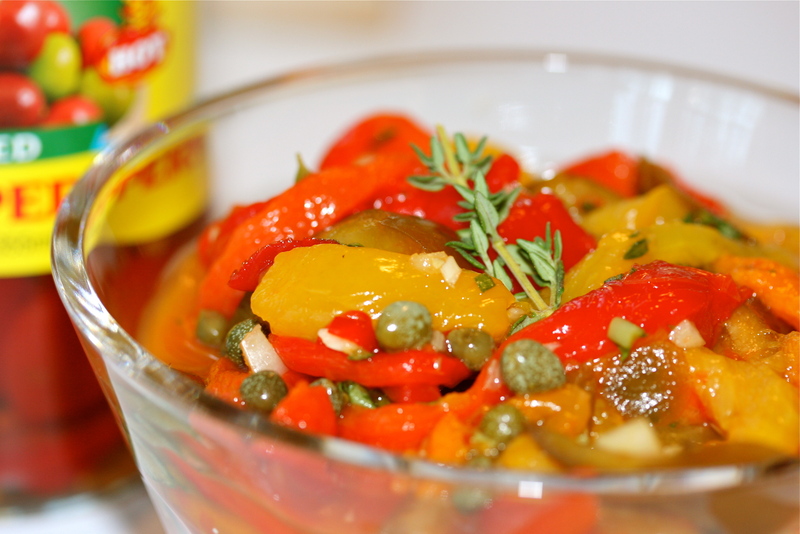 Peperonata can be served on crostini as an appetizer, as a topping for sandwiches, or even as a side with grilled meats. You can control how spicy you make this – we like it hot. Rub the outsides of the whole peppers with a little olive oil and kosher salt. Set the peppers on a sheet tray covered with foil (helps with clean-up). Roast in the oven for about 30 minutes or until the peppers begin to slump and brown, turning them periodically as they roast. Remove the peppers from the oven, place them immediately in a large bowl and cover tightly with plastic wrap. Let the peppers cool in the bowl for about 20 minutes. This will make removing their skins really easy. Once cool enough to touch, peel off the skins and remove the seeds. Slice the peppers in long, thin strips and place them in a bowl. Add all the remaining ingredients to the peppers and stir. Let sit at room temperature for 30 minutes before serving. This can be made a day in advance. The longer it sits, the better the flavors come together. If making in advance, wait to add the chopped fresh basil until right before serving. Thanks Jackie! We love it with lots of hot cherry peppers! Super spicy! YUM!